Southeast Alaska, sometimes referred to as the Alaska Panhandle, lies west from the northern half of the Canadian province, British Columbia. The majority of its area is part of the Tongass National Forest, the United States’ largest national forest. It is part of the temperate rain forest, which extends from Northern California to Prince William Sound. In many places, the international border runs along the crest of the Coast Mountains. The region is noted for its spectacular scenery and wet climate. The population is under 100,000 and nearly half of the population are concentrated in the state capital, Juneau. The primary industries of Southeast Alaska are commercial fishing and tourism. Logging was an important industry in the past, but has been steadily declining with competition from other areas and the closure of the region’s major pulp mills. I first went there in 1978 and was involved there until 2004 when my visa was cancelled for overstaying on a few occasions. It was my lifeblood and inspiration all that time, and I am determined to return there when the powers that be are prepared to forget about past transgressions. I spent most of my time exploring Southeast Alaska by sea kayak, but there is so much more of that beautiful state that I wish to see and photograph. It is my belated ambition to publish a book of my photos and experiences kayaking with the humpback whales in Southeast Alaska. In the summer months the fjords, bays, inlets and sounds of Southeast Alaska support a sizeable population of migrating humpback whales that feed on shoaling fish like Pacific herring and krill. These humpback whales are distinctive for their advanced cooperative feeding strategies, notably the deployment of large bubble nets and loud piercing calls to herd their prey. This may involve up to two dozen whales, but only one whale specialises in either blowing the bubble net or creating the herding call. It is one of the most spectacular feeding events that it is possible to see anywhere on earth and I became addicted to the surge of adrenaline that accompanied every feeding lunge. It became like a gigantic game of cat and mouse keeping up with the whales and anticipating their feeding lunges. Sea birds often gave me clues but after many years of accompanying the whales I developed extra-sensory instincts for tuning into their underwater movements. I also used a hydrophone to track the feeding sequence. At first came the release of bubbles, like the sound of someone turning a tap on full; the whales are circling their prey and one of them is starting to create a cylinder of ascending bubbles to trap the fish. Then the loud, piercing feeding call that shakes my body to the core. The bubbles appear on the surface and I try to calculate the size of the bubble net and where the centre may be. The feeding call gets louder and louder, and seems to go up an octave, then I quickly brace myself for action to ensure that I’m not going to obstruct them and I’m positioned to take some photos. Suddenly the epicentre of the bubble net erupts with fish flashing out of the water like shards of broken glass and then the water becomes a boiling cauldron of large bubbles escaping from the gaping jaws of the rapidly ascending whales. Then the water explodes with a tightly packed formation of fully extended jaws, bristling baleen and the rippling pleats of their fully distended throats. 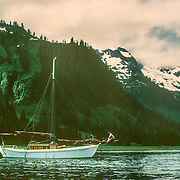 In 1980, in my second year working at a salmon cannery in Southeast Alaska, my partner and I bought this boat from another Englishman, an experienced boat-builder who built it in Bend, Oregon and sailed it up through the Inside Passage to Alaska. It was a 26 ft gaff cutter, with a hard chine hull, designed by a well known Port Angeles boat designer called George Buehler, who specialises in classic designs that are relatively cheap, fast and simple to build, and can be built in a back-garden or small shop by anyone without specialist boat construction skills. It was designed to provide maximum deck for such a small boat at the expense of the size of the cabin, which was very snug and cozy to say the least, and my skull had to become quickly accustomed to the frequent knocks on the stout timbers. The open foredeck provided enough space to stow my Klepper folding kayak as well as a small dinghy very aptly named "Teacup". The only problem with the deck was that it leaked very badly, partly because Jim the boat builder, had used mahogany for the deck, which is not ideal because of its tendency for excessive shrinkage and opening up of the seams. In his frustration he had hastily painted it with bitumastic paint, which quickly solved the problem, but left us with a very messy job to remove it, because it was neither aesthetically complimentary to an otherwise elegant looking boat, and the sticky, oily blackness contaminated everything. After we stripped it off I vainly attempted to recaulk the coach roof and deck, but we had sacrificed a dry interior for a more attractive exterior, which wasn't ideal for one of the wettest places on earth. My Alaskan partner Anne was very interested in Arthurian legends so we named the boat “Avalon”. She looked beautiful with her burgundy gaff sails aloft, but unfortunately the sailing was never consistently very good because of the very erratic wind direction and speeds in the sounds between the mainland and the islands. 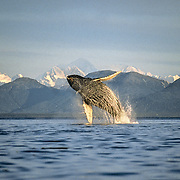 The marine and terrestrial eco-systems of Southeast Alaska support an abundance of wildlife. Five species of Pacific salmon return to the many rivers of the Tongass National Forest to spawn; they provide a feeding bonanza for the bears, bald eagles, ravens and other wildlife, and replenish the forest with their decaying bodies. Wolves and Sitka black-tail deer find a safe haven in the extensive forests, and on the mainland moose are abundant in the river valleys and mountain goats are found above the tree line. 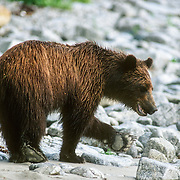 Brown and black bears are found on the mainland but do not inhabit the same islands offshore. River otters have adapted to exploiting the sea for foraging and in many areas sea otters have become re-established after almost being hunted to extinction. Many migratory birds spend the summer months nesting along the archipelago and the rich waters abound with many different species of seabirds. Apart from the migrating humpback whales the most prominent marine mammals in the waters of Southeast Alaska are harbour seals and Steller sea lions, which are both preyed upon by roaming pods of transient orcas. Harbour porpoises and Dall porpoises can also be observed. Glaciers are amazing phenomena that illuminate the higher and lower latitudes of the earth, and are undoubtedly one of the natural wonders of Alaska. There are an estimated 100,000 glaciers in Alaska. 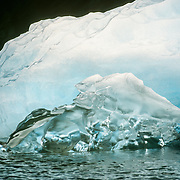 Glaciers are rivers of ice that flow from ice fields high in the mountains, and are constantly fed by the accumulation and compression of the annual snowfall. In constant motion, they can move several feet a day or even surge as much as 300 feet (90 m). Some are retreating due to increased melting, possibly because of climate change, or less snowfall feeding them. 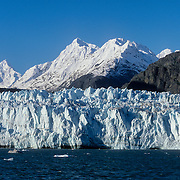 Southeast Alaska has many tidewater glaciers that flow to the sea, where large slabs of ice break off, or calves at the head of fjords or inlets, which become clogged with the icebergs. The creaking of calving glaciers, followed by the crashing of the ice into the water and subsequent waves, is one of the greatest spectacles that you can regularly experience in Alaska. The beautiful blue colour of glacial ice is created by the density according to its age, which absorbs all the colours of the spectrum except blue, which is reflected. Approaching a tidewater glacier in either a boat or a kayak always required the greatest concentration because of the density of icebergs, and once in close proximity to the towering wall of ice there was always a great sense of awe combined with the unnerving precariousness at the prospect of a huge slab of ice being suddenly dumped into the tranquil frigid water transforming it into an undulating ice-studded leviathon. The main glaciers that I sometimes visited in Southeast Alaska were in Glacier Bay in the north where there are 16 active tidewater glaciers, Tracy Arm and Endicott Arm, and the southernmost tidewater glacier in the USA, the Le Conte Glacier, just to the south of Petersburg. The fjords where glaciers calve are always spectacular with steep sides and many waterfalls, and the water is a distinctive glacial blue due to the sediment or glacial flour discharged by the glacier. Whenever I was looking for humpback whales I was constantly scanning the horizon for the telltale sign of their blows; the plumes of their exhaled breath. One of the most striking views was either in the morning or the evening when volleys of their blows were ignited by the low rays of the sun along the horizon before melting away like misty wraiths. Much less majestic was the nauseating smell of their breath at closer quarters. I was often enveloped in clouds of their stinky fishy breath, especially if I was downwind. Their breath is not only smelly, but also very oily, so I frequently had to clean the residue from my lens. They typically dive for 5-10 minutes, although they can hold their breath much longer. Unlike land mammals that store the majority of air in the lungs, whales store less than 25% in the lungs with almost half of the oxygen contained in haemoglobin molecules. They also store oxygen in myoglobin molecules in the muscles. When they dive, their metabolism and heart rate decreases to reduce the rate of oxygen consumption, and blood is cut off from their extremities. Their enormous lung capacity and oxygen retention enables them to dive in excess of 20 minutes to depths up to 500 ft for foraging. When they surface they have a limited time to exchange the air in their lungs, so it is exhaled with tremendous force in an explosive manner, which vapourises the seawater that is trapped above the two blowholes, creating the visible pillar of water vapour. The inhalation is equally powerful, and at close quarters I was able to view how quickly the blowholes open and snap shut. After a few inhalations they begin to sound by arching their backs into a prominent hump, and then raise their flukes aloft, which sheds a curtain of water, before sliding gracefully into the sea. It is a beautiful balletic sequence that I never tired of viewing and photographing, and as with their blows it was enhanced and illuminated by the rising and the setting sun. Humpback whales are as Herman Melville observed “ the most gamesome of whales”. They have become the popular focus of whale watching worldwide because they are the most obliging to entertain with their surface activity. They can be observed employing a variety of feeding techniques, including the spectacular cooperative bubble net feeding, blowing plumes of ethereal, but stinky breath, raising their flukes when they sound, and more inscrutable behaviour such as spy-hopping, pec-slapping, lobtailing and breaching. Over many years of observing their behaviour I have been able to draw some of my own conclusions regarding their more playful looking behaviour. It is quite apparent that they employ some of their more ostentatious behaviour: breaching, when they jump out of the water; pec-slapping, when they lay on the surface whilst slapping the water with their enormous flippers; lobtailing, when they lift their flukes vertically and slap the water with a tremendous thud - to create a shock to herd their prey when they are hunting. It has also been apparent to me that they employ these activities both as a threat display when boats get too close, and also just for recreational fun, because after all shouldn’t they and other animals have the same need to express their joie de vivre. I know from my experience and observations that having a whale of a time is a very literal expression. It is also likely that they use such percussive activities to dislodge barnacles and other parasites. This kind of behaviour is always very unpredictable, especially breaching, which is consequently very difficult to photograph, especially as with any of their activity that I was trying to capture I also had to paddle my kayak, and my hands were divided between paddle and camera. Their sporadic breaching became the most elusive and tantalising of things to photograph, and it always seemed as if they were waiting for me to release my camera and pick up my paddle before breaching again! Whenever I encountered humpback whales they provided the icing on the cake on my kayaking trips, but the cherry on the icing was undoubtedly the awesome orcas. I didn’t encounter them as often as the humpback whales, but whenever I did I always knew that I was going to be in for an extreme workout , because they travel faster and farther than the whales, sometimes covering up to 200 miles a day, compared with my greatest distance of paddling 30 miles a day. Their blows are very distinctive, being more shrill and piercing than the explosive guttural blows of the whales, so I could always tell when they were approaching. On average I could expect to have 3 or 4 good encounters with orcas, and it was usually with transient pods hunting for other marine mammals comprising fewer members than resident pods that concentrate on areas where there is an abundance of salmon or other fish. I remember the trepidation that I felt when I first kayaked with orcas, but any fear was soon dispelled when I realised that their only interest in me was purely out of curiosity. In fact the orcas always seemed to be much more interested in me than the whales apart from the juveniles. Sometimes curious bulls with their huge dorsal fins towering above them would swim directly towards me as if they were going to slice me in half, which accelerated my heartbeat, and then on the verge of impact turn on their sides and slide just beneath my kayak. 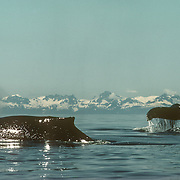 During the 1980s photo identification established that there are three stocks of transient orcas that frequent Alaskan waters: one from Prince William Sound through the Kenai Fjords; one in the Gulf of Alaska, Aleutian Islands, and Bering Sea; and the West Coast transients stock which occurs between Southeast Alaska and California. 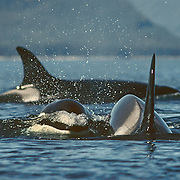 An estimated transient 218 orcas occur in the waters of Washington State, British Columbia, and Southeast Alaska. The northern resident stock, which occurs from Vancouver Island to Southeast Alaska, has a minimum of 216. When I was out on the sea I often encountered harbour seals or Steller sea lions. They are markedly different in their characteristics; harbour seals are very shy and would usually pop their heads up furtively behind my kayak, but Steller sea lions were always inquisitive, if not a little wary, and would always investigate me as close as they would dare, and often race alongside me. The sea lions never failed to entertain with their loud, boisterous and sometimes playful behaviour. Seal haul outs are usually comatose places compared with the lively circuses that are sea lion haul outs. Getting close to the sea lions was always much easier than the seals because of all the commotion and pandemonium, especially when the big bulls were sparring. 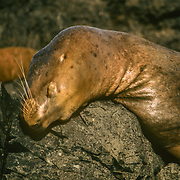 The average adult male Steller sea lion is about 1,250 lb (560kg), but can double that weight and reach a length of 10 ft. 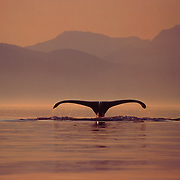 The females are from 7.5 ft – 9.5 ft ( 2.30m- 2.90m) in length and can weigh up to 770 lb (350kg). They are opportunistic feeders and eat a wide range of fish, and need to eat about 5-6% of their body weight a day. When the males are defending their territories they may go without eating for over a month. They are divided into a Western and Eastern population in Alaska. There have been drastic declines in numbers, especially in the west, but it now appears that their numbers have stabilised, and showing small increases. The average weight for harbour seals in Alaska is about 180 lbs (82kg), with males weighing up to 285 lbs(129kg). They can reach 5-6 ft (1.7-1.9m) in length. Like the sea lions they are opportunistic feeders and take advantage of seasonally available prey. They are able to dive up to depths of 1640 ft (500m) and can remain submerged for over 20 mins. Like the sea lions they are as graceful in the water as they are ungainly on land. Their numbers have also fluctuated in different parts of Alaska. As with the sea lions the reasons are unknown but multiple factors are likely involved. Southeast Alaska, sometimes referred to as the Alaska Panhandle, lies west from the northern half of the Canadian province, British Columbia. The majority of its area is part of the Tongass National Forest, the United States’ largest national forest. It is part of the temperate rain forest, which extends from Northern California to Prince William Sound. In many places, the international border runs along the crest of the Coast Mountains. 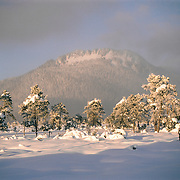 The region is noted for its spectacular scenery and wet climate. The population is under 100,000 and nearly half of the population are concentrated in the state capital, Juneau. The primary industries of Southeast Alaska are commercial fishing and tourism. Logging was an important industry in the past, but has been steadily declining with competition from other areas and the closure of the region’s major pulp mills. I first went there in 1978 and was involved there until 2004 when my visa was cancelled for overstaying on a few occasions. It was my lifeblood and inspiration all that time, and I am determined to return there when the powers that be are prepared to forget about past transgressions. I spent most of my time exploring Southeast Alaska by sea kayak, but there is so much more of that beautiful state that I wish to see and photograph. It is my belated ambition to publish a book of my photos and experiences kayaking with the humpback whales in Southeast Alaska. Although I spent so much time trying to find and keep up with the whales in my kayak out on the water, I was also completely absorbed by the amazing Southeast Alaskan landscape bordering the sea, from the wave-sculpted shoreline, abundant inter-tidal life, colourful flower meadows, rich and diverse sphagnum bogs (muskeg), up through the lichen and moss-festooned temperate rainforests populated by huge trees, tidewater glaciers shimmering with ancient ice and the backbone of snow-capped coastal mountains rising so abruptly from the sea. The Tongass National Forest is the largest in the USA at 17 million acres (69,000km2) and the largest remaining temperate rainforest on earth. It encompasses islands of the Alexander Archipelago, fjords and glaciers, and the peaks of the Coast Mountains. More than 80% of Southeast Alaska is in Tongass and with its thousands of islands, fjords and bays the forest has 11,000 miles of coastline, about half of that of North America. Though its land area is huge, about 40% of Tongass is composed of wetlands, snow, ice, rock, and non-forest vegetation, while the remaining 10 million acres (40,000 km2) are forested. About 5 million acres (20,000 km2) are considered “productive old-growth”, and 4,500,000 acres (18,000 km2) of those are preserved as wilderness areas. 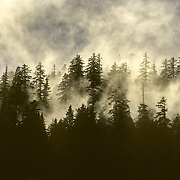 The vast coastal forest includes towering hemlock, spruce and red and yellow cedar. Beneath the massive conifers are young evergreens and shrubs such as devil’s club, skunk cabbage, blueberry and huckleberry. Moss and ferns cover the ground, and lichens drape many trees. The coastline is punctuated by tidewater glaciers from the Hubbard Glacier in the north, the world’s longest and easily Alaska’s most active, to the Le Conte Glacier, a short boat ride from Petersburg or Wrangell, the southernmost tidewater glacier on the continent. In between is the crowning jewel of Southeast Alaska, Glacier Bay National Park and Preserve.